His only problem is he can‘t find a Marina. Not many people know that Tiger Woods owns a yacht. Ever since the golfer Greg Norman got his big yacht, people around the world have marveled at how big it is. Well, Tiger Woods earned a lot more money playing golf than Greg Norman, and he invested it in all the right places so he too could have a yacht. Recently, Tiger withdrew some of his money and bought a yacht. He had it decked out to his specifications, with all the things he wanted on a yacht. He secretly did all of this until the yacht was ready to set sail. A photographer on assignment to photograph sea turtles in the ocean happened upon the yacht during it‘s initial shakedown cruise, and got the very first photo of Tiger Woods yacht. 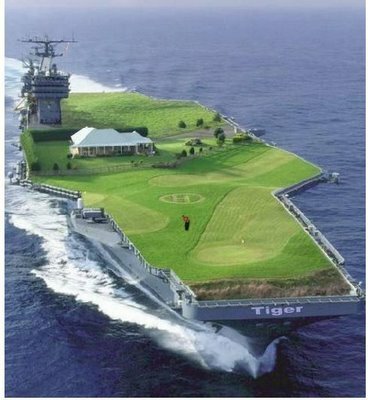 This is Tiger‘s new yacht.